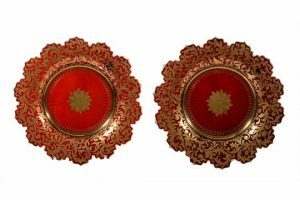 A pair of ruby-flashed and gilt glass plates, mid 19th century, with crenellated rims and gilt with a central flowerhead, within a scrolling foliate border. 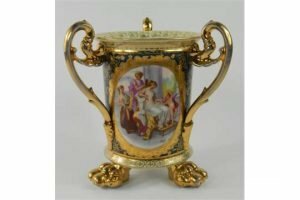 A Vienna style porcelain tyg, printed with a scene of Neo Classical maidens, within gilt borders, on three paw feet. 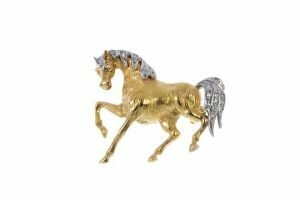 A diamond novelty brooch designed as a textured horse, with brilliant-cut diamond mane and tail. Estimated total diamond weight 0.10ct. 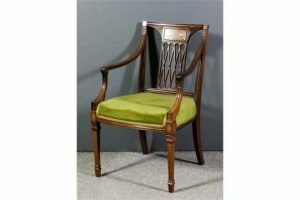 An Edwardian rosewood square back open armchair, the moulded back inset with panel, inlaid with floral scroll ornament and with fretted splat, leaf capped arm terminals and the seat upholstered in green dralon, on square tapered legs inlaid with stringing and bellflower ornament, on spade toes. 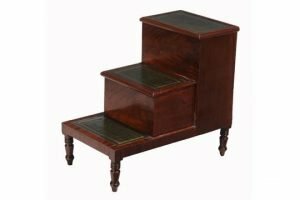 A set of mahogany library steps, second quarter 19th century, the three steps with gilt tooled leather inset tread panels, above turned tapering legs. 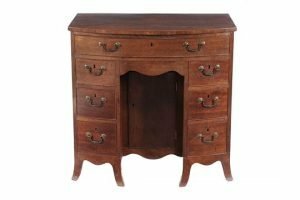 A George III mahogany bow front kneehole desk, circa 1790, the arrangement of seven drawers around the recessed kneehole cupboard door, on out swept bracket feet. 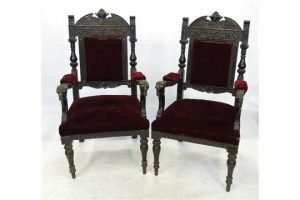 A pair of late 19th century oak hall chairs, having padded back, arms and seats, with turned sides and lion mask handles. 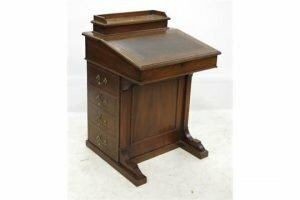 An Edwardian walnut Davenport, with rising lid, fitted with four drawers to one side and dummy drawers to the other. 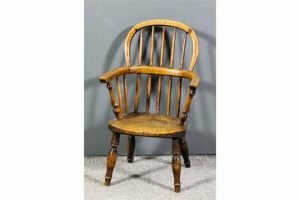 A 19th Century child’s ash and elm seated stick back Windsor armchair, with two tier back, wood seat, on turned legs. 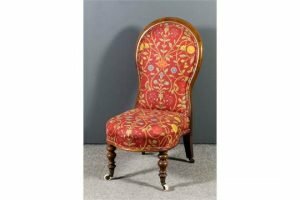 A late Victorian walnut framed spoon back nursing chair, upholstered in red floral cloth, on turned front legs and castors. 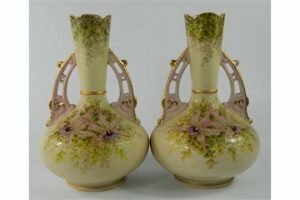 A pair of early 20th century Staffordshire type vases, each decorated with orchids on a blush ivory ground. 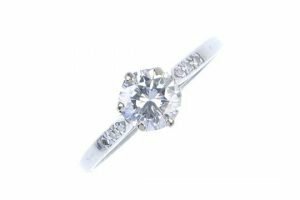 A mid 20th century platinum diamond single-stone ring, the brilliant-cut diamond to the single-cut diamond line shoulders and plain band. Principal diamond estimated weight 0.70ct. 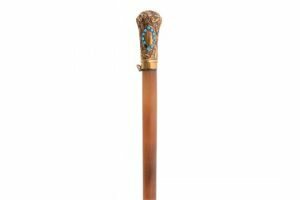 A Victorian gilt metal mounted rhinoceros horn riding crop, late 19th century, the foliate embossed grip set with paste turquoise beads. 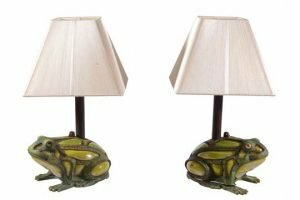 A pair of painted cast iron and reverse painted glass table lamps modelled as frogs, 20th century, the electrical fitments atop straight rods, with square section shades. 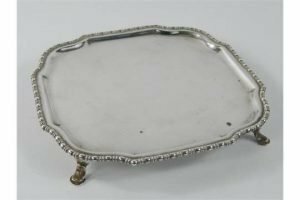 A George V silver waiter of square form, with shaped corners and bead and reel moulded borders, Sheffield 1910. 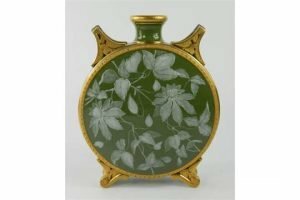 A late 19th century porcelain moon flask, decorated with pate-sur-pate type decoration, with white flowers on a dark green ground within gilt borders. 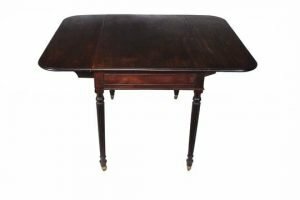 A George III Pembroke table, circa 1800, the rectangular top with rounded corners above a single frieze drawer on slender reeded legs, brass caps, and castors. 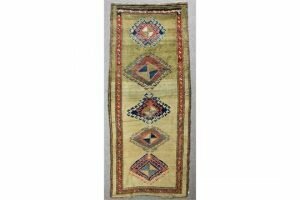 A North-West Persian runner rug woven in blue, ivory and terracotta, with five hooked lozenge shaped medallions on a fawn ground within striped border. A mid 20th century 18 carat gold diamond two-stone crossover ring, the circular-cut diamonds to the asymmetric shoulders and plain band. Estimated total diamond weight 0.70ct. 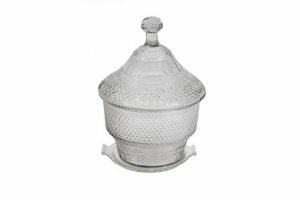 A cut-glass punch bowl and domed cover, first quarter 19th century, cut with diamond bands.